Meet Hamad, But Is He Thai? I am Hamad and I am a Guest Experience Engineer at Expique. But who am I, and am I thai? My first name might not sound Thai, and I can not read and write Thai very well, but I speak like a local and I have a Thai passport. Here is my story. I was born as Somboon Thiangtham in Bangkok, Thailand. Yes Somboon, a very old classical Thai name which nowadays you will not hear often. If a Thai is reading my name, the person might have laughed and started rolling over by now. Somboon means “Complete”. My surname is actually quite a famous surname in Thailand as a distant relative was a well know politician. However, I am actually half Thai and half Pakistani. My father moved from Pakistan about 35 years ago. Bangkok has a small Pakistani community but like over 3% of the Thai Population, I am Muslim. My mother sent me to live in Pakistan with my relatives, from 4 years old till 18 years of age. I went to Pakistan as Somboon but came back to Thailand as Hamadkhan (Hamad). Yes, I changed my name because not only Thai people laugh at Somboon but Pakistani people also laugh (it sounds a bit like Soap in Pakistani!). I spent all my school education in Pakistan and also did a diploma in engineering, before I decided to move back to Thailand. However, after 14 years, everything I know is Pakistan! So, when I came back to Thailand I knew nothing but Tom Yum and Som Tam. Now it has been 8 years already since I move back to Thailand and I am still discovering Thailand’s culture and Thai food. My favorite food in Thailand is Kao Krapao Nueu (I won’t tell what it is, I will let you pronounce it and figure it out by yourself – answer is at the bottom) which can be found everywhere from streets to 5 stars restaurant. I mentioned 5 stars restaurant, but have I ever eaten it in one? No, never. Why pay 500THB when you can get the perfect dish on the street for 40THB. My favorite side dish is Yum Mamuang (keep trying to work this out – answer is at the bottom) and yes be careful while eating it or you may end up spending your night in the toilet like I did. Nothing serious just too spicy. My favorite Thai dessert is Chau Kuay (be careful while pronouncing this word – answer is at the bottom), a black jelly like thing that is nothing but a lemon grass jelly dipped in syrup. Ummmm, I love Thailand. This is home to me. The thing that I love about Thailand is the people here in Thailand, the culture in Thailand, and the amount of respect they pay to each other. 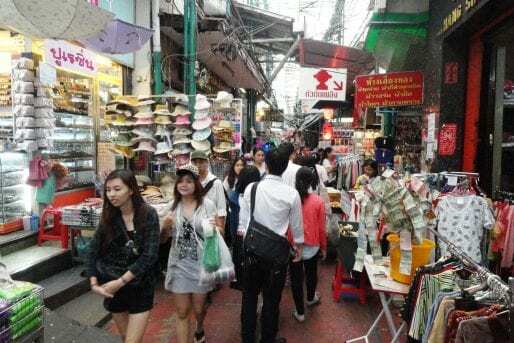 Specifically, I love being around the Bangrak area in Bangkok. This is the area I lived when I first returned to Thailand. It is one of the oldest roads in Thailand. The area is home to many traditional food and traditional culture in Thailand. for example the midnight porridge shop is still crowded with high profile families that has been eating here for the decades. Often I would end up buying OKFC (ok fried chicken), a very easy meal that cost 10 THB for one boneless piece of chicken and 20 THB for drumstick. I know it is not Thai food but I am getting KFC taste with OKFC price. So, yes the food around the area is healthy and cheap … very cheap. You can buy one plate rice and two other dishes for 40-50 THB. Every evening the area is full of people who passes by and buy different kind of food from street vendors on the way home from work. The reason for this area being crowded is because it is home to the oldest bus station for the first bus route in Bangkok. Yes, first bus number is Bus No.1, so people interchange buses at this station. The area has businesses and restaurants that are more than 70 years old. You can say that Bangrak area has a very rich and diverse history being able to withstand the modernization. It is a diverse area with Thai, Chinese, Christian and Muslim communities. In my opinion, history like this should be preserved for new generation to reflect where we have come from. One reason I like working for Expique is not only do we help other people explore Bangkok and discover the local culture, but it also gives me the opportunity to continue learning more about the city I was born in! I hope you like my blog post and share my post. See you in Bangrak!!! BTW you can discover Bangrak on our East Meets West Walking Tour.